Perhaps the stealthiest tax is inflation. In its simplest form, the government prints money and uses the newly printed currency to fund government spending. The government’s money looks like everyone else’s, so no one feels like they have been taxed. But adding to the money supply debases the value of everyone’s currency. If the government printed 10% more money, the purchasing power of each dollar would be reduced by 10%. But unlike the income or sales taxes that are proportional to earnings or spending, respectively, inflation’s tax is proportional to money holdings. It is, in effect, a tax on people holding their wealth in U.S. dollars during inflation. Government officials call this process “quantitative easing.” They argue that consistent deficits are good for the economy. If we were only willing to go high enough, they claim the deficits could solve our economic woes. The Federal Reserve has been printing $85 billion a month. Most people don’t understand this tax on money, but financial advisors do. Imagine that for every dollar, the government gave people a second dollar. On paper it would look like everyone was twice as rich. In reality, the demand for dollars would drop compared to the demand for goods. The price for goods, services and wages ought to double. If they did not, there would be shortages. With the purchasing power of a dollar half as much as it used to be, no one would be better off. Anything you had of value would now be worth the same amount counted in twice as many devalued dollars. Now imagine that for every dollar, the government gave itself another dollar. You would not have any more or less dollars, but dollars would be worth less all the same. With the government’s dollars competing with yours, your dollars would only have half the purchasing power they used to. By this means, the government would have confiscated half the purchasing power of your dollars for itself. Although you need a little cash allocation in your retirement plan for liquidity, it is susceptible to inflation and could interfere with your retirement goals if the allocation is too large. Bonds are also risky. They promise to pay you interest now and the repayment of your principal in the future. When your principal does come back to you, it may have a substantially diminished purchasing power because of inflation. Keeping a portion of your assets in the stability of bonds is important, but most of your money should be invested in appreciating equities. Bonds average 3% over inflation historically and currently have even lower returns due to government policy. We recommend putting most of your assets in appreciating equity investments. Stocks average 6.5% over inflation. Commercial real estate averages 4.9% and residential real estate about 4.1% over inflation. Many retirees don’t recognize the danger of inflation. They think putting 40% or 50% in bonds will make their retirement safer. Studies suggest this is not true. At age 65 putting just 25% in bonds and the remainder in stocks provides a better chance of maintaining your lifestyle in retirement. Our rule is to keep five to seven years of safe spending in fixed income. This strategy allows you to continue portfolio withdrawals without having to sell stocks when the markets are down. At age 65 this means an allocation of about 25% in bonds. The markets are certainly volatile, but they generally appreciate more than inflation. The danger with short money is that it will almost certainly depreciate by inflation. Inflation steals half the value you store in dollars every 16 years. And actual inflation, as opposed to the official numbers, is probably about 2% higher. Inflation has at least four grievous effects on our economy. First, inflation is a regressive tax and hurts the poorest people the most. Poor people keep a greater percentage of what little wealth they have in cash, usually earning a short-term interest rate well below inflation. Unlike the wealthy who keep much of their net worth in appreciating equity investments, poor and middle-income families are more likely to try and build wealth through savings alone rather than savings and investing. Inflation foils many who attempt to build wealth exclusively in their bank account. Bank accounts are already a crude means of savings. It takes 20 years, even without inflation, to grow the same wealth that saving and investing could grow in 13. However, with inflation, it takes a bank account 45 years, a quarter of a century longer than investing, to grow that purchasing power. Second, all interest is taxed at ordinary income rates. If you start the year with $10,000, you will need $10,450 by year-end just to keep up with a 4.5% inflation rate. But if you are in the 25% marginal tax bracket, you will need to earn $600 to pay a 25% tax of $150 and still have $450 left over to keep up with inflation. The greater the rate of inflation, the more difficult it is for people to build real wealth even by saving and investing. Third, our government’s purposeful devaluation of our currency risks our status as the reserve currency of the world. 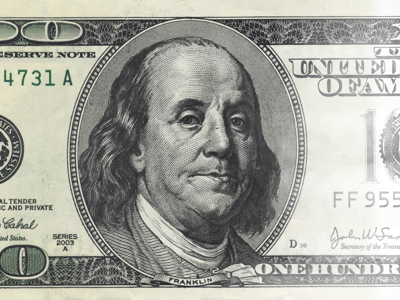 Historically, dollars have been most people’s first choice as a way to store value, and many contracts are written using U.S. dollars as their specifications. However, because inflation is a tax on U.S. dollars, people around the world are already showing signs that they are tired of paying it. Last November, China announced it would no longer accumulate foreign exchange reserves, most of which are U.S. dollars. If the world decides to give up on U.S. dollars, all that money will return home and not only cause further inflation but likely hurt our ability to trade abroad with people who no longer accept our currency. Finally, when there is a penalty to holding dollars, investors are less likely to keep their wealth in the bank. When future dollars are comparably worthless, future contracts become riskier. A rationale may exist to increase the money supply, but there are also limits that should be respected. As a means of taxation, it is a regressive tax that limits the economy by causing people to focus more on maintaining purchasing power than on making real wealth.